Parliament in Kenya has met for the first time since disputed elections, amid continuing tension between the government and the opposition. Voting for a new Speaker is entering a third round after candidates backed by the rivals finished almost level twice. There were angry exchanges earlier as the opposition said it feared the secret vote could be rigged. 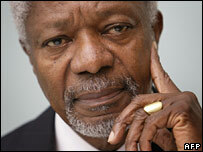 Meanwhile, ex-UN head Kofi Annan has postponed his mediation trip for "a few days" because of flu, the UN said. The vote for Speaker began in acrimony, with the opposition Orange Democratic Movement (ODM) calling for an open rather than secret ballot. Senior ODM official William Ruto said: "We went through [national] elections with a secret ballot, and you stole the vote." But government MP Mutula Kilonzo retorted: "You are now violating the very principle this country has been seeking." After one false start, MPs were called forward to cast secret ballots into a transparent box in the centre of the chamber. The first round ended with 104 votes for ODM-backed Kenneth Marende and 99 for the government-backed Francis ole Kaparo. One of the other three candidates received two votes, and there were two spoilt ballots. In the second round Mr Marende took 104 and Mr Kaparo 102. Those two are now in a third round, where a simple majority will suffice. Security is tight for the meeting, with troops deployed around the parliament building in Nairobi. Opposition MPs had originally planned to sit on government benches. But in the event, their leader Raila Odinga took the seat reserved for the leader of the opposition. His followers declined to stand up as President Mwai Kibaki entered the chamber - an indication that they do not regard his election as valid. It was the first time Mr Odinga and Mr Kibaki had been in the same room since the 27 December election. More than 600 people were killed in unrest that followed. About 250,000 people also fled or were driven from their homes in a country once seen as a beacon of relative stability in East Africa. The BBC's Adam Mynott in Nairobi says the level of violence in Kenya has fallen significantly, but tension remains very high. The ODM became the largest party in parliament, though it does not have an absolute majority. Speaking ahead of parliament resuming, ODM MP Najib Balala said the party was still pressing for a new election. But he told the BBC's Network Africa programme: "We want to prove to the world we are not going to act in an uncivilised way, we are going to parliament, we are going to show that we are controlling parliament." Justice Minister Martha Karua told the BBC she believed cooler heads would prevail. "We are ready to navigate through a hung parliament through persuasion, through negotiations. "We expect that eventually everybody will come to their senses, realise that we've got to learn to live with each other." Former UN chief Kofi Annan was due to arrive on Tuesday at the head of an African mediation team in an effort to bring about negotiations between Mr Kibaki and Mr Odinga. But a UN statement said: "On his way to the airport in Geneva this morning... Kofi Annan was taken ill with a severe flu." It said the mission to Nairobi would be postponed for "a few days". 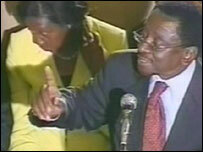 Hardline cabinet minister John Michuki has played down the visit, saying Mr Annan was "not coming at our invitation". He added: "As far as we are concerned, we won an election." But Foreign Minister Moses Wetangula welcomed the visit. "It was agreed by both the government and the ODM that Mr Annan, along with the other three eminent personalities, facilitate dialogue between the two sides, and we are looking forward to their arrival, he said.